I was recently invited by Glasgow based Digirati to submit designs for a timeline they’re producing for their client English Heritage. There was quite a lot of information required to create a flexible timeline that can be used for all the organisations properties, allowing for multiple timelines within the main timeline and a global timeline and scaling options. 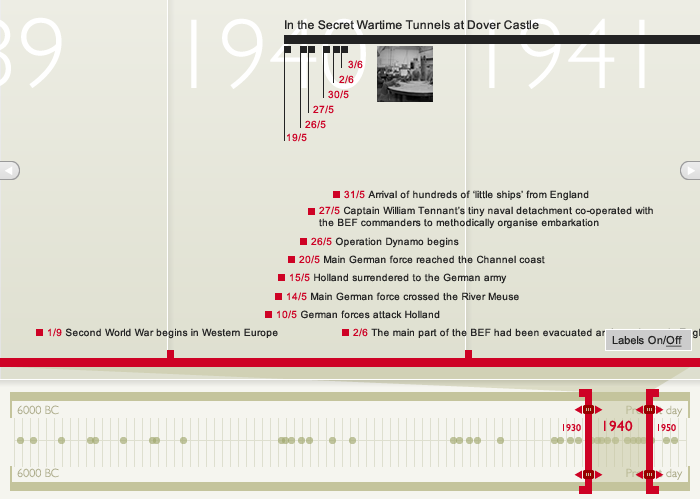 The solution was to extract elements from the EH logo to form the main red timeline and try to indicate on the global timeline where clusters of information were thus helping guide users to points worth exploring. Visually it’s all kept very much on-brand with the EH guidelines to ensure the timeline sits comfortably into the website. The brilliant guys at Unwrong in Brighton will be doing the build in Flash. We work for companies in Finance, Sports, PR, Creative, Arts, Museums, Public Sector & more. © Graphic Clinic. All creative and intellectual property rights reserved.